It was clear that by the end of the game tonight, one of these teams was heading for the playoffs the other heading for the lottery. As some may say, tonight was just a flat out runover by the Spurs on both ends of the court. Bryn Forbes and Patty Mills each scored 17 for the Spurs, who had lost five of eight. 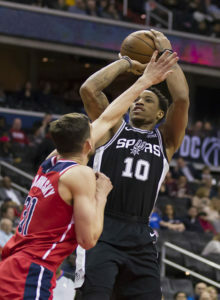 DeMar DeRozan scored 16 points. Bradley Beal scored 25 points and Thomas Bryant had 19 for Washington, which has lost eight of its last 10. The Spurs had eight players score in double figures and shot 66.7% in the first half for a 77-58 lead. San Antonio scored 12 straight points midway through the second quarter for a 62-45 lead and never looked back. San Antonio shot 56 percent overall and led by as many as 24 points in the fourth quarter. “At the start of that second quarter, I thought they were scoring on us at will. A couple of things that we couldn’t stop the dribble drive and stop their bigs. San Antonio is good. They got a lot of high-motor, tough players [who] play hard. You can’t mess up. Patty Mills comes in, you mess up, let him go left in the high pick-and-roll, it’s going to be an automatic three. He had two or three of those. You do that, it puts a lot of pressure on your defense,” said Wizards Head Coach Scott Brooks. Wizards Enter Final Game of Road Swing in Memphis 1-5, What’s Wrong If Anything? Hoyas Get Needed Win Over DePaul, 82-73. Will It Be Enough to Help Postseason Chances?